// //shopsensewidget.shopstyle.com/#/?options=%7B%22columns%22%3A4%2C%22rows%22%3A1%2C%22showBrand%22%3Afalse%2C%22showRetailer%22%3Afalse%2C%22showInfo%22%3Afalse%2C%22showPrice%22%3Afalse%2C%22showSalePrice%22%3Afalse%2C%22size%22%3A200%2C%22pid%22%3A%22uid2609-24507103-35%22%2C%22productIds%22%3A%5B475553846%2C486327853%2C463503195%2C472978900%2C450890121%2C465217555%2C468078608%5D%2C%22type%22%3A%7B%22name%22%3A%22Type%20of%20Widget%22%2C%22list%22%3Anull%2C%22model%22%3A%22quicklist%22%7D%7D Trench coats, vests, and dresses are all the rage right now and I am so excited about it!! They give off such a cool elegant look and I am so obsessed I cannot wait to get more. This is the first trench I have bought since the 4th grade. I remember when I was a little girl I was looking through vogue while I was waiting for my mom to get her hair done at the salon. (I have always been a little fashionista) Anyways, all the women had on these huge elaborate trench coats and I just got heart eyes over the trend and knew I needed to get a trench coat. So I set out to go find one and on my ten year old lemonade stand allowance and shopping leisure I went from store to store looking for the ONE the perfect trench coat. I remember it like it was yesterday, I stepped into Charlotte Russe and there on the wall was this gold shiny trench coat gleaming at me from across the room. It was then, that I first understood what love at first sight meant. haha I saved all my pennies and worked so hard to be able to afford that coat that when I bought it, it was the sweetest victory! Sweeter than when my 4th grade crush slipped a love note into my tote tray. I was so proud of my trench coat I wore it everyday Hot or cold I wasnt going to let this baby out of my sight. I went to school ready to strut my stuff in my new flashy trench coat. I couldnt believe all the negative attention it was getting, everyone made fun of it and teased me for wearing an over sized coat! But I just held my head high and shook my head, like these beezy’s dont even know what high fashion is… get on my level!! And I have never listened to anyone elses fashion advice since. The end LOL I learned quickly that there will always be somebody who doesnt get your style. The fun thing about fashion is you can develop your very own style. It is a way of expression and I love it! Hope you are all having a lovely day! Below are some other trench styles that I am loving! So beautiful I love the long vest! Well, i think that outfit is very stylish. You look great in it! That is the PERFECT vest. I love that outfit! You look amazing! Love this look. You look amazing! 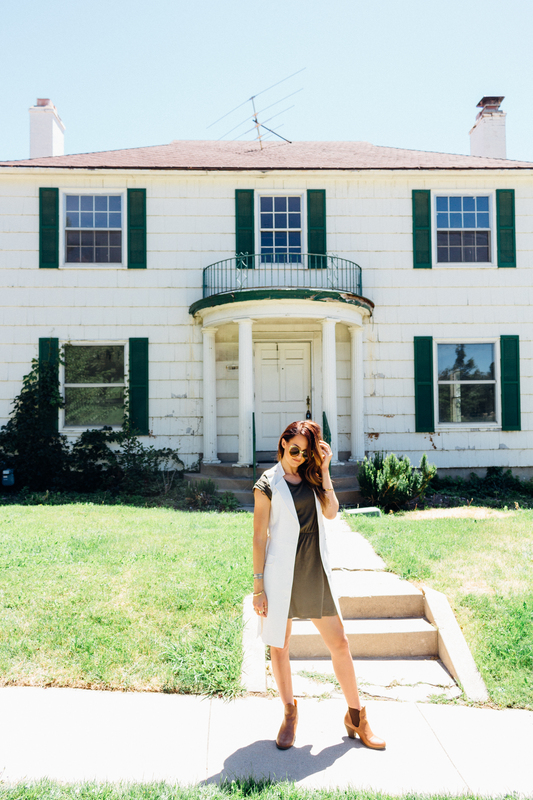 I’m obsessed with trenches and have been on the hunt for the perfect duster for fall! That vest!! It adds such a fun and different element to your outfit. now that is how you wear a long vest jacket! you look fab! A trench really elevates any look, and yours is perfect! This is a great trench vest! Love it paired with the olive green and booties! Too perfect for fall! Beautiful, i am loving the trench vest trend. You paired it beautiful with this olive dress. You look great. I love trench coats but personally don’t know how I feel bout trench vests! This looks so great on you! I think I’m willing to try it out! In love with this look!! Need that trench vest! Fashion is definitely about doing what you want and wearing what feels right for you! I like your style and really like this look too! Love the look, the colour combinations is one of my favorites!! Girl yas! Love this look, you betta werk! girrrl you already knowww! loves, stay beautiful! What a great look. I love I you played up the neutral colors and distressed wear on the abandoned house with the neutrals of this ensemble. Such a clever photo shoot. This is something you would see in a fashion magazine. Rundown house & a stylish model just hanging out on the porch. Love the direction you went in. You are so right, a trench like this can be worn in any season, I mean, it’s so versatile and beautiful! I liked the boots as well, and the whole outfit looks sweet and chic! The location is also awesome and you look really fab! Love this vest thrown over this dress! Beautiful! I have a vest look up on the blog today too! You look so pretty. Love your trench vest very much!! You look gorgeous!! Oh my you are way too nice!!! Thanks Jessica, loves! Love everything about this outfit ! You look fantastic ! Thank you Nina so sweet! I have quite a few sleeveless jackets like this! They are amazing and you wear yours well! Eek! I love this trend! sleeveless jackets are amazing! You rocked it girl. I love the dress wich looks perfect on you! oh my! You just made my day with that comment! Loves! 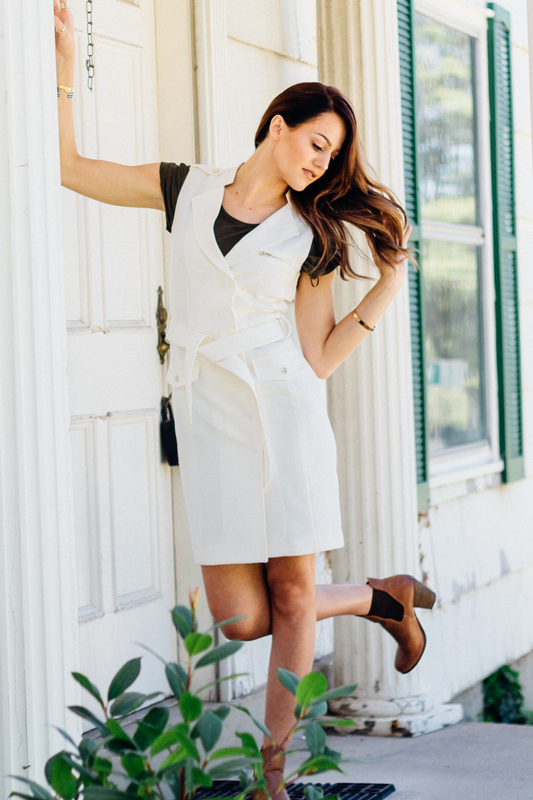 The trench vest is so perfect for fall! thanks boo! I am in love with it too!